Collectors' and dealers' gripes are usually valid. Many of the complaints center on outrageous experiences with dealers or customers, flawed condition reports, buyers' premium (just what do we get for it? ), and the incredible cost of shipping, especially from the UK. So if you want to get it off your chest, this is the place. Email me to tell all. Since posting this, the seller has modified his listing. There are some figures that are very definitely modern repros. This issue is not even debatable. The state of affairs is obvious even to the blind--and I am not intending to be funny here. If you close your eyes and touch one of these repro figures, you know you are not holding The Real Thing. Currently there is a figure titled LADY GARDENER on eBay. Click HERE and you will see it (listing has since been modified). The eBay figure is the same genre as these shown below. Thanks for your email. In this case I am going to disagree as I bought this , with others at a reputable local auction house . It may have been a reproduction but it is 19th century. I have double checked this with an independant auctioneer friend and valuer. It is a pleasure getting a polite reply, but oh is this seller wrong. I don't want to sound arrogant, but I did include this site in my email, and the seller should have been able to deduce that I know what I am talking about. Let's list a few of the problems. Pearlware is associated with figures made between 1780 and 1840. After 1840, clay was whiter, so it wasn't necessary to add cobalt to the glaze--and blue-tinted pearlware faded into the pages of history. 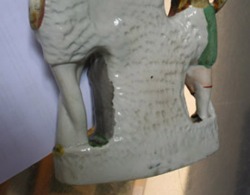 If the seller thinks the figure "may have been a reproduction" it is not pearlware. Early figures are made from multiple mold parts. Thus, for example, the arms of the lady gardener would be molded separately, as would her watering can. The ebay figure is one smooth object. 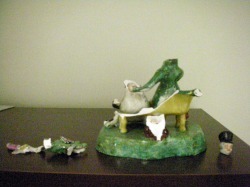 The front of the figure has been molded as one. With my eyes closed I could feel that it is not an early figure. The bocage fronds on early figures are distinct objects, each molded individually and then assembled into a bocage. Here the bocage is one lumpy structure. Early bocage flowers are molded individually and applied to the bocage in most cases--and certainly in the case of small gardener figures. Here the bocage flowers have been molded in one with the bocage leaves. Early enamels are in a distinct color palette. The colors on this figure are all wrong....as is the glaze. Just look around this site. You will only see these greens on the REPROS page! The crazing on the eBay figure is very obvious. Early figures often exhibit crazing, but it is fine and it does not jump out to greet you. Reproduction figures are routinely deliberately crazed to simulate age--and the resulting coarse crazing is just as you see here. The back of the eBay figure is unpainted!! Early figures can be expected to be painted in the round. 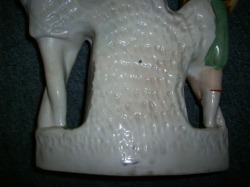 The figure has a closed base. 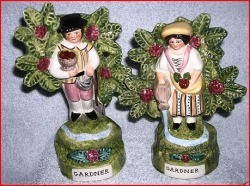 Early small gardener figures are always open. You can look right into the figure and see the way it was pressed into a mold. I suspect this figure was slip cast, and the interior is smooth. But closing off the bottom conceals this fact. I have 135 photographs of gardeners/gardener pairs lined up for my next book. The title LADY GARDENER does not appear on one of them. As you collectors know, lady gardeners, if titled, are titled GARDENER or MATE (frequently misspelled). Titles on early figures are typically impressed into the figure, and the hollowed impression is then painted. Here the title is simply painted onto a smooth surface. I could go on and on. You get the gist. Above all, let me be clear: I don't think this figure was made any time in the 19th century. I believe it was made sometime from the latter part of the 20thC, but I can't give a date. To even call it a reproduction elevates it to a status it doesn't deserve. Perhaps "in the style of" an earlier figure might say it best. As for the seller who bought this at "a reputable auction house." Aside from a very few auction houses, you have to tread carefully. I routinely communicate with auction houses that get it wrong. Strangely, not one of them has ever challenged my expertise, and the listing is usually modified in response to my concern. I know we all have much to learn in the field of early pottery, but I would confidently stake my knowledge against that of any "independent auctioneer friend and valuer" or any "reputable local auction house." We all make mistakes, and the important thing is what we do about them. I hope the seller relists his item as a reproduction. You can decide for yourself. If you agree with me, avoid this figure. You might even ask eBay to withdraw the listing. If you don't, you can buy the figure for GBP70 or about $110. If I haven't convinced you yet, I have convinced the seller of the reproduction figure. He has amended his description appropriately and adjusted his price. He intends seeking recourse from the auction house, and I hope he gets it as it seems the item may have been wrongly described. A friend of mine defines an expert (read "ex-spurt") as “a has-been drip under pressure”…which brings us to today’s cautionary tale of expertise. What if you find a figure offered for sale with an expert appraisal? Would this increase your confidence and the price you are prepared to pay? I bet it would…but please think again. An eBay seller—clearly with the very best intentions—sent pictures of a figure along with a description to an online valuation service. 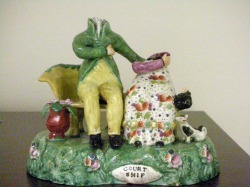 The seller described his figure as A crude but unusual Staffordshire type figure. Usual crazing to glaze but no damage or restoration noted. Of c 1890 appearance. What a nice surprise it must have been to learn that the expert believed this figure was a lot earlier than 1890 and quite valuable. In fact, the expert, whose name we do not know, dated the figure as 1810-1830, adding This is early nineteenth century rather than later, a nice object. A very rare subject in Staffordshire pottery, Italian Comedy figures are always very desirable, and there are many collectors who specialize in the Italian Comedy across all collecting fields, competing with the pottery collector. The expert valued the figure at GBP 600-800. Sounds good doesn’t it? Just the sort of great news a would-be seller wants? Armed with this information, the seller listed the figure on eBay (item 220832302346) for GBP 690. Again, let me say that this seller had honorable intentions. He had gone to the trouble and expense to do the right thing. He paid for a valuation, and he didn't ask any more for his figure than he was led to believe it was worth. Bad things shouldn’t happen to good people, so what went wrong this time? Well, as you may have guessed, the figure was not an early figure but a much later reproduction. I knew this immediately, even with my dominant eye closed. How did I know? 1. HARLEQUIN was crudely painted on the green mound base of the figure. You never see a title painted on an early figure in that manner. Titles are usually painted onto the flat front surface of rectangular bases. On mound bases, the letters are typically impressed into the mold and then painted… and the letters have serifs. If there is an exception to this,I can’t think of it. 2. The modeling was coarse and clumsy, with the plume on Harlequin’s hat being reduced to a clump of clay. 3. The flowers scattered on the base were formed with the base itself. I would have expected them to be formed separately and then applied to the base. 4. The painting of harlequin’s face is dead, devoid of animation. Just wrong. My expertise is pre-Victorian earthenware figures and this is not a pre-Victorian figure. Definitely not made between 1810 and 1830. But I can’t offer an expert opinion as to whether it was made in 1890 or 1990! I wrote to the seller, who immediately pulled the listing, and I wrote to www.ValueMyStuff.com, who supplied the valuation. I received a courteous reply telling me that they will look into this. But I remain excessively bothered, and my concern goes beyond the fact that the figure was dated and valued very incorrectly. Please tell me how you accurately appraise a figure from photographs? (Can a doctor diagnose you from your photograph, even if you include a description of your ailments?) How can you be sure there is no restoration without closely examining the figure in person? Restoration has a huge impact on value….but our expert did not qualify his opinion to allow for the possibility that the figure might once have been in seventeen pieces! When selling, you should aim to be the smallest item in a big London auction, in order to get to these people. Ha! “get to these people” What an odd turn of phrase. We are Collectors, not game at a target shoot. And please name the big London auction house that will accept a single item with a value of GBP 600. The minimum is far higher….unless the item is part of a large, valuable collection. After having worked for Phillips for many years, our Ceramics expert joined Sotheby’s where he valued ceramics and glass from numerous famous collections and country houses. Active in London and in the regions, he is still involved in major valuations in England and on the continent. His passion for the ceramics subject has made him one of the most knowledgeable and focused experts within this field. There are now quite a few online sources for quick appraisals for a few dollars or pounds. Are you getting what you paid for? Are you getting an expert or an ex-spurt? You decide. An individual has apparently been very busy transforming the appearance of Sunderland lustre wares to increase their value. The wares have changed hands on eBay and at auction. An amazing tale with many lessons for us all. The same type of faking can appear on our early figures. Figure collectors with limited knowledge who buy from unknown sources risk making similar costly mistakes. Stephen Smith, a UK lustre collector has done a masterful job of tracking these transactions, and eBay has been informed, to no avail. A chilling tale that can easily spoil a market. Read the gory details by clicking here . And Buyer Beware! I’m addicted to your blog. Here’s a tale of diminishing restoration you might be interested in. 1650. The top flag section has been broken off and restored back, this includes the neck of the central British sailor and the cup on his head. The restoration is more visible to the reverse on the crazing is covered, but it has been professionally executed. The soldier with the purple sash has been broken around his waist and down his left side, similarly professionally restored. The torso of the other soldier also shows signs of restoration. There is clear spraying and some light staining to the base. The gilding of the raised title is totally rubbed. The white sections of the group overall display light staining. The guide price – and so I guess the reserve – was high (around £700). It didn’t sell. 129. Restoration to back of both flags, otherwise ok. I e-mailed Nicholson’s the more complete Toovey’s condition report and asked them to confirm from the description of the damage that the figure was one and the same. I should add that the figure has very distinctive discoloration to the back of one of the soldiers’ orange jackets, so there was no doubt it was the same one. Nicholson’s didn’t respond to my e-mail. The figure sold for £460. Myrna adds the pictures below--and read blog entry for August 16. Look like the same figure to you? An American dealer friend tells me she recently bought a minor figure at auction in the UK. As always, her heart sank when she learned she was the 'winner' because shipping is such a pain. The auction house deals with a 'recommended' shipper--but the high estimate for posting this small item was about as much as the purchase price of the item. The dealer declined, and said she would get it picked up by a friend instead. The auction house told her to be sure the friend brought authorization and full identification, including photo ID. Well armed with everything including a blood sample, the friend set off to pick up the item. Stuck in traffic, he called the auction house....only to learn that the figure was gone. It had been sent off with the 'recommended' shipper. A call to the shipper was futile. They were rude and hung up. The dealer insisted that the 'recommended' shipper return the item to the auction house, so her friend could collect it another day. The shipper demanded GBP10 for this service! Outrage? They should have toddled back super-fast to the auction house, as I see it, because they were in possession of goods without authorization. The matter dragged on, and it seems the shipper finally returned the goods to the auction house on a day when no special trip was required. Suited their convenience, but the dealer's friend had to make yet another trip. If you think this was a rinky-dinky auction house in the backwoods of the UK, forget it. This auction house is quite close to London--in other words, close enough to standard business practices to know better! Yesterday, Woolley & Wallis, UK, had an interesting bust of Minerva at auction. I had asked for a condition report in March. On March 25, I received this reply. Thank you for your enquiry. I'm afraid we are unable to provide condition reports until next week. However, your request has been logged and we will be in touch before the sale. I hope you will bear with us.Kind regards Clare Durham. Well, that was very nice. Trouble is, I waited and waited. I checked my Junk Mail folder in case the condition report had been diverted. But the sale came and went without my getting it. So why didn't I ask again? Frankly, I am tired of asking again and again. If the auction house can't be bothered, I shan't be bothered. Of course the seller is the loser, as is the auction house. As for me, well I have my money to spend another day. PS. Posted May 7. Have just received this explanation from Clare Durham at Woolley and Wallis. I would like, if you wouldn't mind, for you to pass on our apologies to this person. We receive hundreds of requests for condition reports prior to a sale and have every intention of dealing with them all. Sadly, almost inevitably, one or two get buried and we think we've responded when we haven't. There have also been occasions when e-mails have bounced back to us or even when we think they've got through, only to be rung by the client and told that they haven't. I fully understand your correspondent's attitude of why should they chase us, but I'm afraid the answer to that question is that we may be under the impression that we have fully answered their query. I assure you, nobody is deliberately ignored, no matter how long their list of requests or even, on occasion, how bizarre or demanding! Please, to all your website visitors, if they haven't heard back from the auction house, do pick up the phone and chase them. They would far rather have a chasing phone call from you, than find that your request has inadvertently been missed.I'm very sorry that we disappointed the person in question on this occasion and hope that they will return to us for future sales and demand better service! How nice of Clare to reply, and I think we can all learn from her positive response. A Tale of Two Auctions. Today, I encountered experiences at both ends of the auction spectrum. The bad news: Bonhams Chester, where I left a bid via online registration. The figure sold for less than my bid... so I thought I had it. But when I called to pay for it, I discovered I was not the winner. And why not? Well, the system had not recorded my bid. “A glitch” they would investigate, I was told. I was beyond furious. I am sure the seller would have been too…but he will never know! But perhaps I should thank Bonhams. Had my bid not been hit by a ‘glitch’, I would instead be writing about the miseries of shipping from the UK. Bonhams, like most auction houses, will not handle postage/shipping. And for the buyer it is costly, and slow, and tedious to arrange with a third party shipper. Today also left a bid at Keys, Norfolk. The level of service was so good that I am almost in shock. Each email request was answered very promptly. Believe it or not, I got the figure for a fraction of my bid, so the auctioneer was clearly honest. And to top it all, Keys will mail the figure to me. Easy. I supplied my details and now await a parcel. Don’t we all love those parcels! But often my heart drops when I win at auction in the UK because of the hassle of getting the item home. Keys made the experience a pleasure. AND NOTE that Bonhams’ buyer’s premium is 20%; Keys charge 15%. Bonhams will not take payment by credit card; Keys does. Denham's had an auction today with a few Staffordshire pieces. One of them was a modest piece which they did not recognize as Royal and greatly undervalued at only 20 to 30 pounds. While restored, it was attractive and provided a needed match to a single I have. I phoned last Friday, got a telephonic condition report, and left a bid far above their estimate. I provided my contact information and confirmed the bid. Today I called and found out they had no record of my bid. The lot sold in the room for 42 pounds, well below my offer. Ouch! Anyone at the other end? This was a bad auction day. I got up at the crack of dawn to bid at Gorringes, UK, on line. I know how to do this. I have done it lots of times at various auction houses. When my lot came up, I bid right away at GBP 180 and I kept bidding very quickly. The whole process couldn’t have taken 3 seconds, and I clicked my mouse at GBP 340. I thought I had it. No, instead another bidder “won” this lot at GBP 320. What a start to my day! Seems to me that if an auction house is going to take online bids, it should TAKE them! A couple of years ago I purchased a pair of horse head wall brackets, I'm sure you know the ones I mean, quite large, 12" tall or so. I purchased them from Richard Winterton Auctioneers in England via a bid I left for them to execute on my behalf. Well, I won the pair and what a surprise it was exactly the top amount that I would pay. This was when the fun began. I paid promptly with a credit card for which they charged 3% for the privilege. They then advised me to contact someone else for shipping as they do not do shipping. They gave me a name which I cannot recall and I contacted them and paid for shipping. After three weeks I had no shipment and no contact from the auction house or the shipper. I contacted Winterton, they were very nasty and told me to contact the shipper which I did. About two weeks later I finally received the pair. They were packed in a file box like you would use to store records. I knew immediately that they were broken. I opened the box and there was one small piece of bubble wrap loosely entwined around the figures. They were not packed for a trip across the street much less a trip across the Atlantic. I could go on and on but I wound up not getting any reimbursement from either party. Since then I do not bid at an auction unless I am going to be there. I don't trust any of them and feel they are all lazy. They own nothing and not only do they get ridiculous commissions from the buyer they also get it from the seller! I'm sure every collector could tell a horror story about auction houses. It's unfortunate really because it should be a pleasant experience. You are buying something you would dearly like and it turns into a nightmare. Today, October 9, I received the condition report I requested from Bonhams, Honniton, for a lot on the AUGUST 28 sale! Better late than never? No. Late means too late to bid! The seller's loss, I guess. You will get a kick out of this one. McTears Auction Room in Glasgow had two small 18cm x 15cm prints for sale and whilst they collect 20% premium once the hammer falls they do nothing, rip you off and hand you over to Mailboxes. The charge for shipping within the UK was FORTY POUNDS. as rooms to be avoided at all cost! PS from Myrna. Conversion to metric: these light little items only measure 7" by 6 ". Pity McTears couldn't just pop them into a tiny box. I shudder to think what postage to the US would have been, but I am guessing at least GBP 80--possibly more than the hammer price of the lot. I was stung last year, when the shipping cost more than the figure. Every collector's nightmare--a tragedy that shouldn't have happened. Above: views of a Sherratt style COURTSHIP group. It had a full bocage and was in ONE piece when bought. Left: When the buyer got the box, it rattled and this is her first peep inside her costly box. This Sherratt style group was sold at auction (Cheffins, UK) earlier this year. Cheffins, like most UK auction houses, do not do their own shipping but recommend MailBoxes. The buyer engaged MailBoxes to ship this figure along with a smaller one for the enormous amount of GBP 149.68 (around $300). I can write forever about the cost of UK shipping...but not now! Buying at auction internationally takes time and effort: perhaps setting the alarm to bid in the middle of the night, arranging foreign payment (auction houses in the UK that do take credit cards usually add another few percentage points for doing so! ), and finally arranging shipment--all so time consuming and frustrating. In this case, the buyer spent a lot of money and I am sure she was waiting for THAT box with childlike anticipation....at least I always feel like that. Can you imagine how the buyer's heart dropped when the box arrived and it rattled???? You can see the rest for yourself. 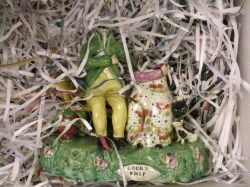 COURTSHIP is damaged to the point of being valueless, and the smaller figure in the box also suffered breakage. The buyer contacted MailBoxes, only to find that her significant shipping cost did not include insurance. I am told that MailBoxes had shipped through UPS and enquired as to whether UPS would cough up. If you were UPS and you saw this "packing" job, would you accept responsibility? Where was the bubble wrap and peanuts we all routinely use? How about boxing the two figures within the outer box so one couldn't bash against the other? I am so sad at the loss of this figure. I know the collector who sent it to auction, reluctantly. A new collector purchased it, and she is even more upset by the loss of the figure "on her watch" than by her considerable financial loss.